I was lucky enough to attend the recent SharePoint 2009 Conference in Las Vegas and one of the great things I did there was to catch up with the SharePoint Runners (or #sprunners on Twitter) and www.mapmyrun.com. The SharePoint Runners are a group of people who are involved with SharePoint in their working lives and like to run in their own time. The meetings were held at 06:30ish and it was tough getting out of bed early on a morning after late nights of eating/drinking and having fun SharePoint development/reading 🙂 but it was very rewarding, meeting as I did a number of fellow Twitterers that to that point I’d only ever exchanged Tweets with. It was also kinda weird running down the strip and we received a number of “encouragements” as we made our way through the die hard gamblers/drinkers who were still to go to bed. 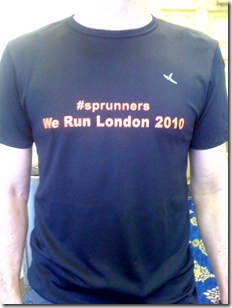 Anyway, I was glad I joined up with the #sprunners so when I signed up to attend the SharePoint Evolution 2010 Conference which is taking place in London from the 19th – 21st April, I thought maybe I can organise a similar thing. While the Las Vegas #sprunners event was great, I’d like to think that the SharePoint Evo #sprunners event will be a similar great event as I’ve put together a preliminary route which takes in a number of the London “sights” and the final couple of miles of the London Marathon – an event which takes place only days later Sunday 25th April and which I’m running in! As I’ll be at the tapering down point of my training, the route is only 4.7 miles but it should still be a great run taking in a crossing of the river Thames, Big Ben, Houses Of Parliament, Buckingham Palace, The Mall, Whitehall and Downing Street – bring your cameras if you’ve never been to London before! The finer details of this are still to be put in place but I’m planning to run all 3 mornings – setting off at about 07:00ish and reckoning on the route taking about 40 – 45 mins depending on the pace of the day. 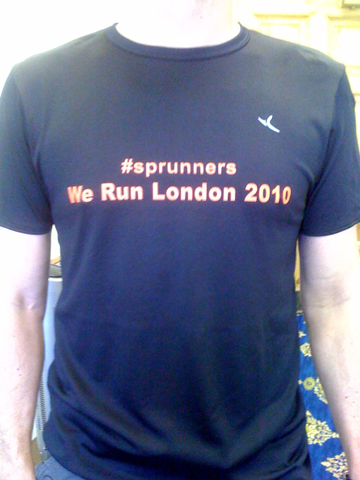 As with the Las Vegas #sprunners event, I’ll be looking to get some #SPRunners “We run this town” running shirts that I’ll be giving out at the “Exhibitor Evening Reception” on the 19th or before if you can find me out and about on the Sunday night before – “stop me and ask for one”. Please leave a comment at the end of this post with your European running shirt size If you’d like to take part. Don’t worry if you don’t sign up, just turn up and run. Apologies for the carpet – it’s not my house! I’m planning an initial distribution of these at the #spevo footy tournament on the Sunday night before the conference and I’ll have some with me during the conference so if you see me, stop me and ask for yours. I will not be able to attend the SharePoint Evolution conference. Never been to London and it looks like a great route. I will be with the #sprunners in Spirit. Enjoy! I \’m willing to participate Tuesday morning! 😉 Size Small/Medium pls. Perfect location to start off from – next to my hotel – count me in. T-Shirt Size (M). Right next to mine as well – "County Hall" – where you staying? Hi Anthony – what a great idea this is! Thanks for organising. I am attending the conference and like you I am tapering after months of training for London – attending the conference then home to Bristol for a couple of days then back with my family on the Saturday to run the race Sunday – may see you on the way round eh? I will be up for meeting you on the Tuesday and 4.7 miles is perfect for my tapering programme. I will meet you at the start point on the Tuesday – T Shirt size medium please? How much do I owe you for the shirt? Look forward to meeting you there…Hope you travel plans arent hampered with the Volcanic ash disruption – you should be fine though if coming from the US! This entry was posted on January 2, 2010 at 15:21 and filed under Sharepoint. You can follow any responses to this entry through the RSS feed. You can leave a response, or trackback from your own site.